US Secretary of State Hillary Clinton and Hollywood superstar Meryl Streep have led tributes to the prominent human rights activist and trade unionist Inez McCormack who passed away this week [Monday] following a short illness. Inez was the first female President of the Irish Congress of Trade Unions, and an unrelenting activist for the equality provisions of the Good Friday Agreement. In the 1980s, she was a signatory to the historic MacBride Principles, a corporate code of conduct for US companies investing in the North which demanded outcomes to address religious inequality in employment here. Inez was also the founder of, and adviser to, the pioneering Participation and the Practice of Rights organisation (PPR), which provides support to local disadvantaged communities to battle the social and economic inequalities and deprivation they face. In 2011, Inez, along with Michelle Obama, Hillary Clinton, Meryl Streep and Mu Sochua [the Nobel Peace Prize nominee from Cambodia], was named by the US magazine Newsweek as one of ‘150 Women Who Shake the World’. She was recognised for her work in enabling women to improve the quality of their lives through spreading the values of human rights. Hollywood A-lister Streep chose to portray Inez’s life in a reading of the documentary play SEVEN in New York in 2010. SEVEN tells the personal stories of Inez and six other women who triumphed over enormous obstacles to create major positive change in their home countries. But it was her long fight for equality and human rights, particularly for women, for which Inez will be most remembered. “I was deeply saddened to learn of the passing of my dear friend, Inez McCormack,” said Secretary Clinton. 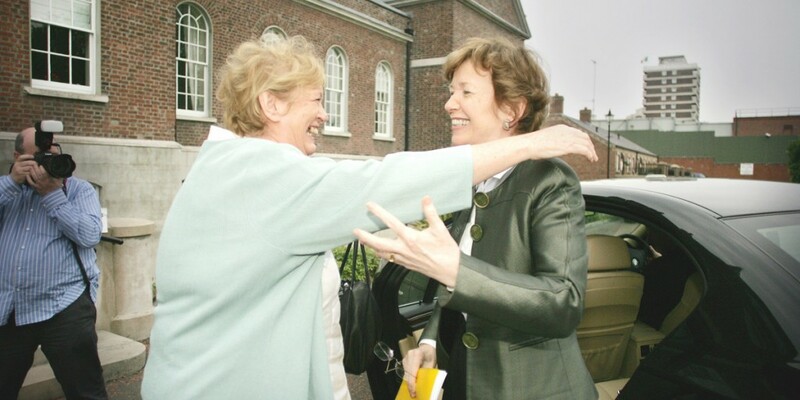 “For decades, Inez promoted peace and reconciliation in her beloved Northern Ireland and around the world. She challenged women and men to find a way to put aside their differences, move past hurt and anger, and work together to end violence and build a fair and lasting peace. It was a tremendous challenge, but Inez met it with joy. In a statement, Ms Streep said Inez’s work had touched upon the lives of the thousands of women and families whose lives she had helped to improve. “She gave voice to women who had no say in their lives, and hope to others who marked her example. I salute her life,” she said. Sinn Féin President Gerry Adams TD extended his deepest sympathy and condolences to Inez’s family. “Inez McCormack was a fearless opponent of injustice and a determined champion of civil rights, equality, women’s and workers’ rights and fair employment,” he said. Patrick Corrigan, Northern Ireland Programme Director of Amnesty International, described Inez as “an inspirational leader”. “Inez McCormack’s legacy is to be found in the fairer Northern Ireland which she helped create and in the equality and rights protections she helped to enshrine in our statute books,” he said. “Most importantly of all, Inez McCormack’s legacy is to be found in the generations of young human rights activists whom she inspired, both here and around the world, through her leadership, determination and humour. Former President Mary Robinson also paid tribute. “Inez was a remarkable woman with a remarkable capacity for friendship. She would want us to remember the positive issues she embraced with a combination of lateral thinking and supportive warmth: the McBride Principles, her leadership of the Irish Congress of Trade Unions, and her own Union, Unison, her championing of women’s rights and combating gender-based violence, at home and in countries of conflict. Nicola Browne, Director (Policy) of PPR, said Inez was committed and determined throughout her career.